Don’t settle for making a living, pursue making a life! Here are 5 things I challenge each of us to give freely, expect nothing in return. Our Time– Time is something that is finite for each of us. It cannot be stored, multiplied, or created. To give of our time is to give that which can never be replaced. It is most often the hardest thing to give. Our Money– Make as much as you can so you can give as much as you can. These words, spoken to me by my grandfather when I was younger, have helped me in learning to give of my finances. Grandpa also told me that when he found his finances were lacking the first thing he did was to give a little more. Our Love – A favorite quote of mine is by George MacDonald. “It is by loving, and not by being loved, that one can come nearest the soul of another”. God set the standard of loving first, even when we were yet sinners, and we are called to follow by loving the unlovable. Rick Warren wrote in his book The Purpose Driven Life, ” You can’t call yourself a loving person until God has put an unlovable person in your life”. Our Respect – Respect is often seen as something to be traded, if you respect me then I will respect you. For this to work you must always be judging those around you, deeming them worthy of your respect or not. It is tiresome, futile, and always ends in isolation with few ever being worthy of your respect. The reverse of this is seeing each person as God’s creation, created in His image. Our respect is then not given based on their actions but on our love of their creator, God. Our Failures – This one might strike you as a bit strange, let me explain. If you had to write of list of the top 10 things you have learned in life and how you learned them I would dare to say that many would be of how you learned through failure. Failure is not something we naturally are drawn to share. We like to be seen as strong and successful. But it is in those failures, frailties, and suffering, and the sharing of them, that we are able to bless and encourage those around us. 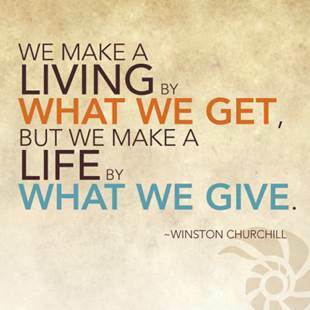 The thrill of making a living lasts only a day, the thrill of making a life of giving lasts a lifetime. Let us step forward in the giving of ourselves and all that we have. This entry was posted in Leadership by Leadership By Faith. Bookmark the permalink.